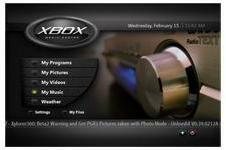 Now that the 360 is in full effect, the old Xbox is headed to the living room or the bedroom to stream the TV shows recorded on the PC. Sounds confusing, but think of it as recycling a game console to be a Tivo-like device. I refuse to pay TiVo their monthly fees, but it would be nice to not have to watch the recorded shows we like in the office all the time. Dan C was kind enough to come by last weekend and run ethernet throughout our house with me, so no more wireless hiccups to worry about either.